Base64 is the simple command line Windows used to encode and decode files in the “Base64” format. 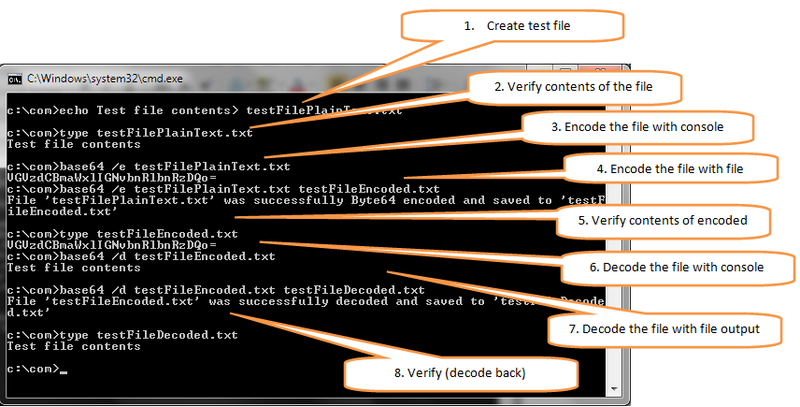 This code is spin-off of ‘Binary Viewer’ - much larger project where Base64 encoder/decoder is part of the package. Difference is that ‘Binary Viewer’ is ‘fat’ GUI program with plenty of functionality and base64 encoder/decoder is very small part of it, while program presented here is lean command line utility suitable to be used in automated batch processing. If optional parameter [destinationFile] is omitted in the command line, program output will be redirected to the console window. The following screen illustrates usage of Base64. Compiled code. Just drop it to your local folder. The same compiled code as above. If your security settings don’t allow downloading executables use this link to download the program. C# source code of the program if you want to see how it was done (very easy) or if you want to extend/modify and build your own functionality on top of it.